A naturalist who spent months at a time living on her own among wild creatures in remote jungles, Sy Montgomery had always felt more comfortable with animals than with people. So she gladly opened her heart to a sick piglet who had been crowded away from nourishing meals by his stronger siblings. Yet Sy had no inkling that this piglet, later named Christopher Hogwood, would not only survive but flourish. 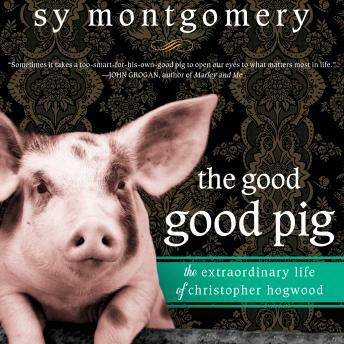 The Good Good Pig celebrates Christopher Hogwood in all his glory, from his inauspicious infancy to hog heaven in rural New Hampshire. At first, his domain included only Sy's hens and border collie, Tess. Then the neighbors began fetching Christopher home from his unauthorized jaunts, the little girls next door started giving him baths, and the villagers brought him delicious leftovers. His fame increased along with his girth. He was featured in USA Today and on several National Public Radio programs. But as this enchanting book describes, Christopher Hogwood's influence extended far beyond celebrity. Sy reveals what she learned from this generous soul who just so happened to be a pig-lessons about self-acceptance, the value of community, and the pleasures of the sweet green Earth.